Thirteen years ago today …… Michael Schumacher scored his 26th victory at the 1997 Belgian Grand Prix. The racetrack was virtually flooded before the start of the race, and therefore it was too dangerous for a normal “standing start”. For the first time in F1 history, the race was started behind the safety car. Jacques Villeneuve was in pole position, followed by Jean Alesi in the Benetton, and Schumacher in third. The cars followed the safety car for a number of laps, until the track’s condition had improved. Twenty-two cars and a safety car cleared the track surface of excess water quickly. Michael Schumacher quickly demonstrated that he was the “Rain Master”, passing Alesi into La Source with a very brave move. 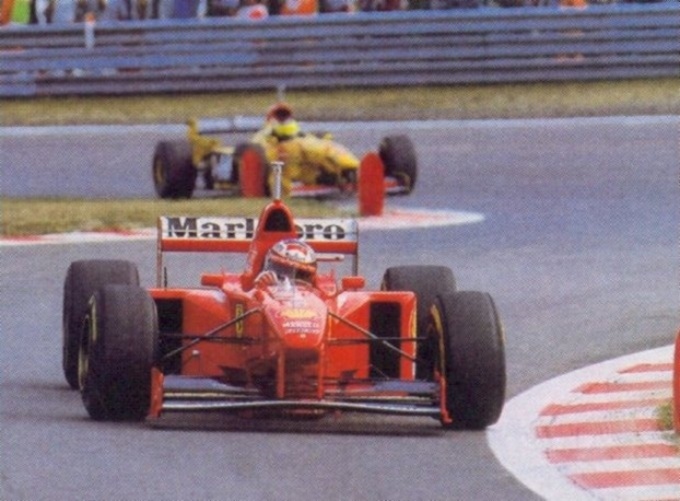 Schumacher caught and passed Villeneuve easily, and left his competitors for dead. Jacques was never a brilliant performer in the wet, and the Williams FW19 wasn’t a dominant force in those conditions. Schumacher crossed the line 26 seconds ahead of second-place man Giancarlo Fisichella (Jordan Peugeot). Michael would go on to challenge Villenueve for the Championship. It all ended in tears, as Schumacher would collide with the Canadian during the final round at Jerez, and was excluded from the entire Championship! Danica Patrick – F1 Material?